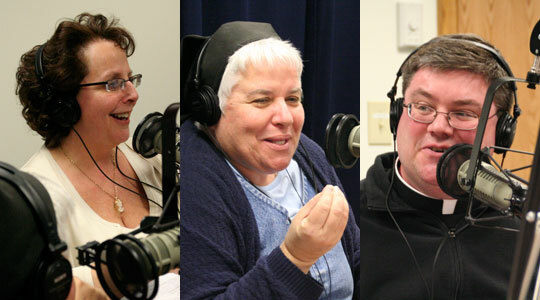 Today’s guest(s): Maureen Heil, Director of Programs and Development for the Pontifical Mission Societies in Boston, and Sister Lisa Valentini of the Missionary Sisters of the Most Sacred Heart of Jesus. Today’s topics: The work of the Pontifical Mission Societies in the Archdiocese, nationally, and internationally and the universal call to all Christians to support the missions. A summary of today’s show: Maureen Heil and Sr. Lisa Valentini tell us about the Pontifical Mission Societies and the essential missionary nature of the Church. Sr. Lisa and Maureen also related some of their eye-opening, heart-wrenching, and heart-warming experiences serving on the missions in Haiti, the Dominican Republic, Ecuador and more. Also, the missionary history of the Archdiocese of Boston as both recipient and giver. 1st segment: Scot welcomed Fr. Chris back as co-host. Fr. Chris said the seminary had its annual seminary workday, doing a spring cleaning of the seminary and preparing for the Triduum. If people are having problems hearing the over-the-air signal, they can listen on TheGoodCatholicLife.com either streaming or for download. WQOM’s engineers are hard at work fixing the issues related to the powerful signal of our radio dial neighbor, WBZ 1030. Fr. Chris said he’s hearing a lot of excitement for the radio show and for the radio station. Introducing today’s topic, Scot said it’s a common misunderstanding that there is just one mission society in the archdiocese, but in fact there are four. An explanation after the break. 2nd segment: Scot and Fr. Chris welcomed Maureen and Sr. Lisa to the show. Scot said he always thought the Propagation of the Faith was the pontifical mission society. Maureen said as a legal corporation in Boston they do business as the Propagation of the Faith, Inc., but there are four related societies. The Propagation of the Faith is responsible for mission education in developed countries, to help them be aware of the need to pray for the missions around the world and to support them. The Holy Childhood Association is for children from Kindergarten to Confirmation. The motto is children helping children. All the support goes to help children 14 and under. The children are asked to pray a Hail Mary every day for kids in the missions who don’t know God loves them, who need an education, food to eat, a place to sleep, medicine when they’re sick, etc. And they’re asked to remember to do this on their own, without prompting from parents or teachers. There is also the St. Peter Apostle Society, which raises up a local clergy in the missions. Helps men in the missions who want to become priests but can’t because of poverty. The Missionary Union is non-fundraising and asks people to pray for the spread of the Gospel around the world. They publish brochures and books. The name “pontifical” connects to the Pope’s title as Supreme Pontiff. The mission societies report through the Congregation for the Evangelization of Peoples to the Pope. They serve at the behest of the local ordinary, but their ties are to the Holy Father. Fr. Chris noted that Maureen travels around the diocese to foster mission awareness. When she talks to young people, he asked what captivates them most? Maureen said it’s most important to convey that the gifts the kids have—talents, goods, spiritual gifts—are gifts from God. Prayer is the most important thing you can do for anyone, she tells them. She also helps them understand the concept of sacrifice and the children are fascinated to find out that the US was mission-dependent only about 100 years ago. Sr. Lisa said her religious order was invited to the US in 1908 as a mission to the immigrant people in the US. The order was founded in Germany. The order might have folded when some of its sisters were martyred in Papua New Guinea, but many woman joined the order because of the witness so the order went to their bishop to be given a new mission for all of the new sisters and they were sent to Pennsylvania. Maureen said American children are so used to their material possessions that she shows them children around the developing world who are happy, but who still lack the basic necessities. Scot said the most common way people in the archdiocese hear about the missions is through a missionary speaking to the parish. Sr. Lisa said the experience is amazing because there is an openness and desire of people to hear the mission message and to help. She believes that it is because missions is of the essence of our faith. Sr. Lisa said in her two years coming to the archdiocese she has often heard people tell her of their desire to help the missions and sometimes how they themselves once wanted to be missionaries. Scot noted that Sister said the missionary character is in the DNA of the Church. Sister said this comes from Jesus’ last words: “Go and make disciples of all nations, baptizing them in the name of the Father, the Son, and the Holy Spirit.” (Matthew 28:19) Sister said she once had the opportunity to baptize a baby in Peru. On an early morning, she had a woman come to her and ask her to baptize the baby. Sister said the priest would do it later in the day, but the woman said her baby was very sick. Sister invited her into the convent chapel and led the woman through the questions committing her to raising the baby as a Catholic. She baptized the baby. Although she never saw the baby again, Sister knew that he had received the spark of God’s life. Maureen said God uses us according to the talents He gave us and determining those talents is essential to our living the mission we have been given. We need to listen to God to learn where He wants us to go. He wants us to go because the Church is missionary by nature. Sometimes we need to go to the person at the desk next to us at work. For others, we need to go to a third world nation. But we can only do this if we listen. Sister pointed out that Maureen is living it as well, having sent her kids on teen mission trips with Sr. Lisa. Sister has three rules for the teens: 1. If you don’t like nuns, don’t come because you’ll be with Sister all day, every day ; 2. If you don’t like to pray, don’t come because you’ll get up early every morning to pray; 3. If you don’t like to sing don’t come, because Sister likes to sing a lot. 3rd segment: Scot said he’s the only one in the room who hasn’t been on a mission trip, but Sr. Lisa and Maureen said they will get him on one. He asked Sr. Lisa about her trip to Haiti last November and earlier in the year. Sr. Lisa said she started her missionary work with a time in Haiti 20 years ago with the group Hands Together. So after the earthquake, she really wanted to go back. Ten weeks after the earthquake she was in the country. They started a feeding program for the children. The sisters called Fr. Tom Hagan from Hands Together to celebrate Mass for the children on Easter. Even though he had been in Haiti for 14 years he was still shocked by the conditions for the people Sister was working with. Hands Together then came back to the locale and built a school for the kids. Maureen said Fr. Hagan is well known in Boston and she often uses his work as an example of what the societies are doing in Haiti. Sr. Lisa returned for November and part of December. She went to a cholera treatment center. It was terrible. But there were many people willing to help out. She said next to the school they had also built a clinic. The situation is still very bad. When cholera arrives in a place, it said to stay for 100 years. Scot asked her to describe the experience of the youth mission trips. She has done 34 of them with hundreds and hundreds of young people. About 10 days ago at a retreat at the University of Penn, she encountered a young woman who went on a mission trip with her to Mexico in 1994. The young woman is now a campus minister. Another young man went on five mission trips to the Dominican Republic and then after college went back there for a year to teach art in all the schools in his area. On teen mission trips, they mostly work with children in the parishes. They do catechesis in what she called a catechesis blitz. The children always pay close attention to her songs and prayers and teaching. Then they break up the group of kids into four groups and do arts and crafts, games, and other activities. At the end, the pray together and sing again and leave them with a rosary and candy. All of the supplies are donated and raised by the teens going on the trip, including all the school supplies. They also brought supplies for the older kids, including backpacks and school supplies for upper grades and even college. Fr. Chris asked about the mite box for the Holy Childhood Association. The mite box has been around for a very long time. It is named after the biblical story of the widow’s mite. They are cardboard boxes and kids use them all year long to make sacrifices. Besides just giving up candy bars, they also do extra chores around the house, do odd jobs, give found money, and any other kind of sacrifice. It’s important to note that in Jesus’ time, the widow didn’t have any real means of support and would have been the poorest of the poor and so for her to give, it would have been from her extreme need. Sr. Lisa notes that pontifical mission societies exist in every country. Even in the Dominican Republic, the kids collect for the missions. Maureen recalled a time in Ecuador, going up a jungle river in a dugout canoe to a remote village. The people they were visiting put on a pageant for the dignitaries and at the end of the pageant, the kids—some of whom had no shoes or a second set of clothes—stepped up and put in their own coins. It was just $5 total. Maureen said one child told her: “We know that there are children who are poorer than we are, because they don’t know Jesus.” They told her to tell the children in the US that they need to pray for them. 4th segment: Fr. Chris brought a group of seminarians on a mission trip last year. He said the most important idea is a quote from Cardinal Cushing, “We are all missionaries.” We are all called to share the Good News. The future priests, when they eventually meet missionaries who come to the parish like Sr. Lisa, will know something of the need. The seminarians could not believe the poverty they encountered. He believes that if more Americans could see the need in the developing world first hand, we would do even more than we do. Scot notes that even our poorest parishes in the US are better off than most mission parishes. Even though we have a shortage of priests in the archdiocese, we have the blessing of hundreds of active priests, whereas in many mission countries, they have a shortage of priests that results in one priest per hundreds of square miles in some cases. Sr. Lisa said it seems we’ve lost the passion for our faith compared to the time of the apostles. We see miracles around us every day, but we forget that God has given us many gifts and that our calling is to go out. Mission comes from a Greek word meaning “to be sent.” We have a responsibility to one another. One way of being missionary is to give by going, but the other is to go by giving. We must give love most of all. Maureen calls it being a stationary missionary. Sr. Lisa was called to leave her home and family, but we are no less called to be missionaries. For us, being stationary does not take away our responsibility to share the Gospel with everyone we encounter. Scot said our first bishop in Boston, Bishop Cheverus, was a missionary himself. 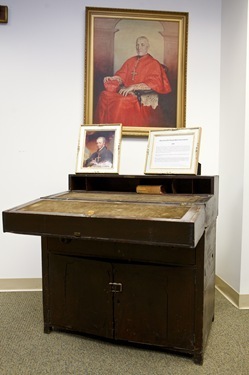 A very important part of Bishop Cheverus’ mission, his desk, adorns the entrance to the Pontifical Mission Societies in the pastoral center. Maureen said it reminds us of where we came from. In his time, there were 300 Catholics in the Boston region. He brought the desk from France and used it to write letters to the French-speaking people in Canada and in France asking them to support his mission with both prayers and financial support. When missionaries come to Boston and see the desk and realize that we have gone from that desk and two priests on horseback to the Archdiocese today and all the dioceses of New England, they see that they are the same sort of seed wherever they are serving. Fr. Chris said every diocese has once been the recipient of missionary activity and eventually sends out missionaries. “To whom much is given, much is expected.” It’s in our DNA to want to give back to others.